We go out every Thursday from March through November. 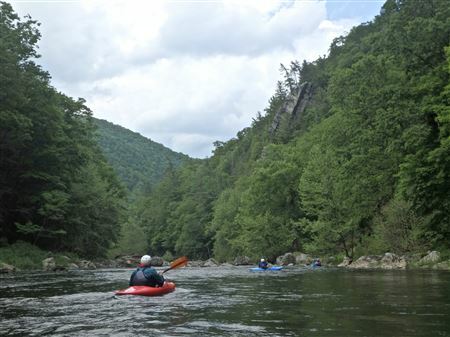 We mostly paddle Class II and III creeks and rivers in West Virginia, Maryland, Virginia and Pennsylvania. A weekly email is sent out, usually on Tuesday or Wednesday, informing our paddlers of the scheduled trips. See our Trip Schedule for upcoming trips. Go to our Trip Reports page to see where we have been paddling. 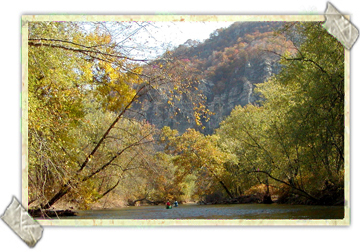 See our Trip Guidelines page for more information about paddling with CCA. Please contact the trip coordinator before heading out for a trip. Rain, and the resulting high water (or low water),can cause trips to be cancelled or relocated. Washington, DC: Rock Creek, Little Falls of the Potomac. While the origin of the Thursday Paddlers is lost in the mists of time, we took on our current form around 1990 under the roving genius of Steve Ettinger, who wrote a whitewater guidebook based on our travels. Supported by the CCA, we go out weekly on Class II to III+ streams from March to November, when Thanksgiving and the end of daylight saving time curtail boating. Our range is in an area three hours from Washington, meaning from the Wilmington/Brandywine in the northeast – to the Richmond/James in the southeast – to the mid-Shenandoah and Lost River to the west – to Wills Creek and the Codorus in the north. We tend to try small streams, and change destination if an attractive one has water. In 2015, with many volunteering to help run over 60 trips, we got almost 500 people out on the water, many, of course, more than once. With as few as three on some trips, we maxed out at 22 on one of our Shenandoah Staircase runs. Usually there is but a single Thursday trip, but as enthusiasm waxes, up to four groups may go out, with all levels from Novice to High Intermediate. In the past two years the Thursday Group has paddled 30 different rivers and streams. We’ve introduced many paddlers to streams they had never run before; indeed, on half the trips we had paddlers totally new to the run. Emails announce the chosen stream(s) late Tuesday/early Wednesday. For the longer trips we meet at various rendezvous points outside of DC to consolidate boats and drivers, and shuck excess vehicles. About 350 people are on the mailing list, though groups have a mean of seven boats. While most of us live around the DC metropolitan area, we come from as far as Annapolis, MD, Martinsburg, WV, Charlottesville, VA, and Hagerstown, MD. If you have expressed an interest in a particular paddle, please check your e-mail on Thursday morning in case we once again have pulled one of our infamous U-turns and gone after an entirely different brook. Please consult CCA’s Trip Guidelines for joining trips like ours. To put together your own trip you can use our Stream-Finder, an on-line guide of 200 local whitewater sections of streams. The Stream-Finder is linked to the American Whitewater River Database, current USGS gauges, weather forecasts and other useful sites. 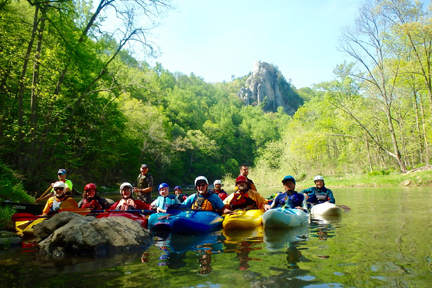 We opened the season on March 10 with 12 paddling down the Cacapon, and after 51 trips attended by 400 paddlers, ended on Nov 17 on our favorite local river. On only one Thursday did we miss an outing. We got out on a number of our favorites – some, like Moorefield Canyon and the James at Richmond, where we hadn’t been for years. We did Hopeville Canyon, Muddy Creek (Pa), the Lost, and Passage Creek. In all we hit 20 different streams. Several times we had two trips out on the same day. About 90 distinct individuals came out with us, and we introduced maybe 30 people to rivers or sections that they’d never done before, and we hope they’ll be taking yet others out on these. Trips involved as few as 4 paddlers and a max of 25. At the same time, the CCA's new website, which came online April 1, 2016, has helped us spread the message in many ways. It allows us to send out the weekly Call to the River about the upcoming trip(s) with the greatest of ease. And we can post our trip reports here - and with photos: Trip Reports One of these, Barb Brown's report about the reappearance of fallen boulders in Hopeville Canyon's Landslide Rapid, has garnered 200 views; these on-line trip reports are a quick way to tell all what we’ve done. Aside from the aforementioned trips and the Lower Potomac from Violettes Lock down to Fletcher's, we also did: Cabin John Creek, Staircase, Thornton, Lower Antietam, Rappahanock Fredericksburg, Brunswick to Point of Rocks, Patapsco, the Lower Yough, and Bloomington. We had a farewell paddle in the Lower Potomac for our friend Glen Pearcy and later held a safety techniques practice nearby. Hopes went unfilled of getting to the lower Gunpowder Falls, where we haven't been for years, and the North Anna, Anacostia, Gettysburg Rock Creek, the Tye, Casselman, the Potomac between Keyser and Cumberland, Moormans River, and the Appomattox. They will be at the top of our list for next year. We Thursday Paddlers now number over 330! Come try the water next year.